update the cart in a non-standard way using ajax – without using a page refresh to update the cart, option prices cannot be updated. When using the premium tier of Product Customizer, please ensure you disable "drawer", "modal", or other fancy-style carts in your theme. The following themes are known to have these cart types or enable them by default. If you use one of these themes, you should change the cart type to "Page" in the theme settings. 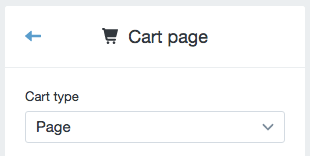 To disable these cart types and change your cart type, please go to "Customize theme", then under "Cart Page" (or a similar section), change "Cart type" to "Page". Drawer, slide out, or modal cart types are incompatible with option pricing.